Worked the Planet Bike booth this weekend for the giant Bike O Rama. 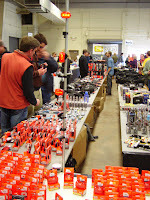 I don't kid when I say giant, in just the 3 hours I was at the show I think I sold a couple thousand dollars worth of Planet Bike accessories. The show had hundreds and hundreds of bikes for sale, with reps from all the major companies there. I just showed up to lend a hand and talk to people about the Planet Bike product. It was amazing how many people became more interested in the product when they found out that they are my sponsor as opposed to working for Planet Bike. Good time catching up with friends from other local companies like Saris and really what could be better than being surrounded by millions of dollars in bike goodies. Above, the BRT, flashes or stays solid red when you turn it on. Great for arm and leg bands when your riding at night. It also works great for your dog, I have one for Lexi my beagle. I let her run at the Dog park and I can see her a quarter of a mile away. Dan P. working hard to sell some pumps or just trying to hold himself up after a rough night out with friends. Dan is also helping me out by turning wrenches on my bike this season. He is putting the final touches on my SS so I can get ready to race the DSG. If your in Madison he is the guy you want to talk to about fixing your bike,but he doesn't come cheap so remember your visa card. Remember safety is not a 9-5 job so be sure to get one of these so you don't get smooshed by a car.